Never Such Innocence launched the pilot poetry and art competition alongside the official opening of Marylebone Boys’ School (MBS) in September 2014. To encourage participation we produced a 56-page resource book to act as a teaching aid and inspire young people to engage with the First World War centenary and our competition. During our pilot year, the resource was directly received by over 500 schools and downloaded over a thousand times. The resource is updated for each competition to include new stories and perspectives from the war period, the fourth edition resource is available as a free download here. Nati Rada, Johvaan Henningham, Kit Nyman-McKnight and Lucas Paul Mueller. 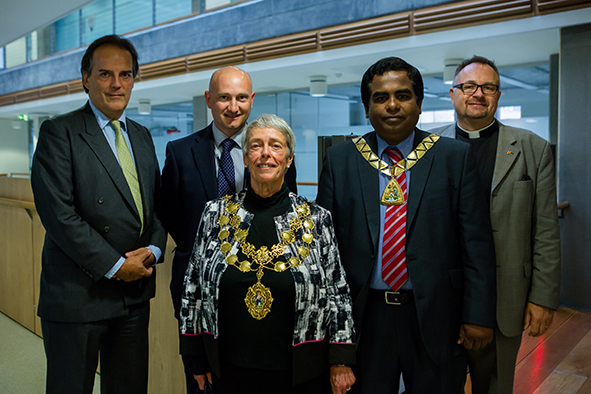 We would like to thank those who supported our launch of the Pilot Competition, particularly the Lord Mayor of Westminster, Mayor of Brent and HE Daniel Mulhall, Ambassador of Ireland to Great Britain. We are hugely appreciative to Marylebone Boys’ School for hosting the launch and we were enthused and encouraged by the response from all schools. The winning entries from the Pilot Competition have been published in the 2014 Winners Booklet.